Going “far enough.” The shape of a novel is like a giant breath. It begins slow, rises, reaches a peak, and then, at the exact climax, there is a catch in the narrative breath. It may come as the hero or heroine acts, finally most completely and courageously themselves. An author has to fight for that “catch in the breath.” Has to know his or her character well enough and be willing to go far enough in the telling. I believe the subconscious is part of that ecstatic juncture. Somehow the subconscious knows that when the human being is at a major crossroads, it comes down to breathing and surviving, and the words and rhythms for that come from the well of the subconscious. See Chautauqua speech “Transcending as a Verb”. Sassy Is as Sassy Does. A character begins somewhere and, by dint of their journey, faces tests and obstacles and is finally challenged with a crisis that will test his or her new found self. So, there is a beginning point to a novel character’s life. It begins here and, facing obstacles, goes there. The most engaging heroes or heroines for the narrative are frequently sassy! In a great variety. Alice in Wonderland is sassy, finally standing up to the Queen of Hearts. Harry Potter may be simply an inconvenience to his aunt and uncle at the beginning of Harry Potter, but that boy gets gumption and stands up to more amazing creatures than we want to count. Holden Caulfield is one sassy young adult in Catcher in the Rye by J.D. Salinger as he gives you straight talk about how he feels, and what he’s determined to do about it. A sassy character has attitude, and any character, sass or not, has to have distinct attitude that will drive story: The foster child Gilly Hopkins in The Great Gilly Hopkins by Katherine Paterson, has attitude big time. She isn’t only Gilly Hopkins, she is the great Gilly Hopkins, no matter what other people think. She wants a mother, and doesn’t care in the beginning who she has to offend to discover and recover that mother. Some characters like Palmer in Wringer by Jerry Spinelli can get away without pure sass; but they need attitude. Palmer who more than anything doesn’t want to be a wringer, ending the life of wounded pigeons at the annual pigeon shoot, needs eventually to care enough, be determined enough, to stand up in the face of hundreds for his pet pigeon, and for what he knows is right.See Chautauqua speech “Sassy Is as Sassy Does”. Voice. I have opened literally hundreds of brown manuscript envelopes, solicited and unsolicited, which means that I have had very little time to consider each one. As an editor, I am not alone in this. I sit down with the manuscript, look at the first page. If I “hear” Voice in the language of the storyteller on that first page, I will read on. If I read flat storytelling without passion or individuality – without Voice – I will simply fold the title page over, put the manuscript back in the brown envelope and send it back to the writer. What is Voice; it is conversational storytelling. It is a verbal thumbprint of what the character is, where the character stands, what the character wants – or doesn’t want. It will help drive the story to its climax. Voice can be somewhat archaic, if it is used in a fantasy, but whether it is a fantasy voice or the voice of a contemporary narrator, it is conversational. Just as conversation is irregular, with its share of exclamations, asides, fragments, run-ons, running along the breathing and emotional patterns of the narrator, so is Voice. It seems to be one of the hardest aspects of the craft to grasp, but it is essential to come to grips with it. Ironically, it is relaxing your writer’s speech, rather than becoming self-consciously literary in tone. I often tell writers searching for Voice: Pretend you (or your narrator) are writing this story to a close friend. Confide your story in them. This will get you close enough to the emotional bones of your story, as well as to the Voice that you need to tell it. “The Search for Voice”, Inkwell, Issue 6, Spring 1998, Manhattanville College. Writing on a Slant. I am always looking for words to press a writer into new space. New idea. It is not enough to reconfigure Cinderella one more time, or even Judy Blume. A writer needs to go to new character and new space, and to look at each in a new way. Look at life on a slant, the viewpoint being quirky, surprising, innovative. Think of The Giver by Lois Lowry, inventing “on her slant” a world so proscribed that almost all risks are eliminated, history is present only in the mind of The Giver, and where – surprisingly enough – there is no free will. Now there’s a slant to test Jonas, the main character, who shocks himself when he discovers he doesn’t want to be The Giver. Holes by Louis Sacher: looking at Green Camp the way Sacher did, a camp whose main activity appears to be digging holes, is looking at life, then writing, “on a slant.” Books like The Invention of Hugo Cabret by Brian Selznick, a kind of literary graphic novel, are written on such a slant that we are thrilled with the originality. People think a writer needs a hook, a vampire, a tragedy. What people need is a vision that allows them to run against the mainstream and type, in search of story, to imagine not what is, but what can or might be.See Chautauqua speech “Writing on a Slant”. Chautauqua, more properly the Highlights Foundation for Writing for Children Conference happened once a year, usually the third week in July. 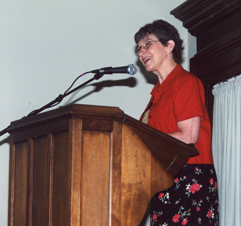 The dream of Kent Brown, who visited the Chautauqua compound as a child, and whose grandparents made enriching children's reading their lifetime goal, the annual conference, which formally began in 1985, was unique. The faculty was made up of well published authors like Jerry Spinelli, Donna Jo Napoli, Floyd Cooper, Peter Jacobi, editors, as well as key booksellers and teachers of children's literature. A hundred conferees from across the United States gathered to workshop on the beautiful parklike Chautauqua campus every summer, meeting one on one, and in workshops sharing their work and refining their craft. Many authors like Newbery winner Sharon Creech, Candace Fleming, Kay Winters, and many more started their writing careers at Chautauqua. The Chautauqua conference has morphed into three more intimate summer workshops based on the Chautauqua plan at The Highlights for Children retreat in rural Honesdale: Writing Fiction for Children and Young Adults (my workshop), Writing from the Heart (led by Joy Cowley) and Writing Nonfiction (led by Peter Jacobi). See www.highlightsfoundation.org/workshops/.